Dwarf Blazing Beauty is a potato leaf dwarf variety that produces oblate medium to medium large fruit that ripen to a glowing medium orange hue. The flavor is intense and delicious with a distinct tartness. Photo by Patrina. 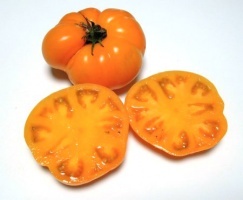 75 days from transplant – first offered to the public in 2014 by Heritage Seed Market and Tatianas TOMATObase. Dwarf Blazing Beauty is a potato leaf dwarf variety that produces oblate medium to medium large fruit that ripen to a glowing medium orange hue. The flavor is intense and delicious with a distinct tartness.. It originated from a cross made by Patrina Nuske Small between Golden Dwarf Champion and Elbe and named Tipsy. Dwarf Blazing Beauty was selected and named by Craig LeHoullier. The blazing, glowing orange color of this variety led to the name bestowed upon it by Craig, and he feels this to be among the best flavored of all of the dwarfs.